When you need household care products - cleaning supplies, paper towels, garbage bags, dishwasher detergent, air fresheners and mops/brooms - you probably have them on your shopping list for Walmart, your neighborhood grocery store or maybe club stores, like Costco, if you want to seriously stock up. You may not automatically think about going to your local home improvement store for these products, but chances are you may have picked up one or more of them while you were buying paint to freshen up your living room, new fixtures for the kitchen, or a replacement toilet for your bathroom. Home improvement stores are significant competitors for retail sales of household products across 15 categories of products analyzed in the first TABS Analytics Household Care Study. 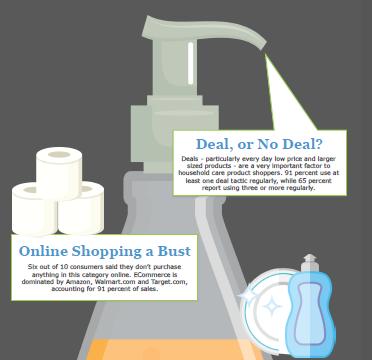 Our first infographic from the 2017 TABS Household Care survey is a study in contrasts: deals are important, online shopping is not. Five key trends, as we see it, are shaping the household care landscape for this important CPG sector. Read on below to learn what they are. 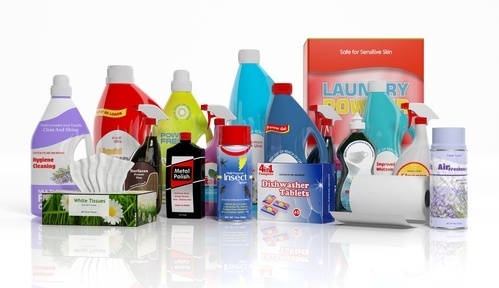 TABS Analytics has added a new study – household products – to its arsenal of consumer packaged goods sector analyses. Conducted in September, the first-ever household care study examined trends, demographics, deal preferences and shopping patterns related to 15 categories in the $75 billion household goods sector: toilet paper, laundry detergent, paper towels, garbage bags, household cleaner, dish soap, facial tissue, air fresheners, fabric softeners, bleach, dishwasher detergent, mops/brooms, paper napkins, disposable tableware and floor-cleaning sheets. Shelton, CT – October 31, 2017 –Walmart leads all outlets for purchase share in the $75 billion household products market, TABS Analytics reported in its first TABS Household Care Study Webinar. This sector has much more channel competition than other consumer packaged goods (CPG) categories, TABS said. Walmart leads with 16.4 percent of purchases, but food retailers aren’t far behind with 14.9 percent. Dollar stores and home improvement stores have a 9.5 and 9.3 percent share, respectively, and there are nine outlets with a purchase share of at least 5 percent. E-commerce share of purchases is only 5 percent and TABS hypothesizes that the low share is a result of the high purchase frequency of many household products across multiple channels.